Saw of the ninja "shikoro"
As explained many times before, for ninjas there is no clear distinction between weapons and tools. Ninjas use the same apparatus in different ways depending on the circumstances, sometimes it will be used as a weapon and at other times as a tool. I am going to describe about devices which were basically used only as tools. It goes without saying that in the Warring States period, the targets of ninjas in most cases were the lords of castles. Ninjas were security conscience to protect their property and the important information they had, because other lords were their enemies they used to look for invaders often in their properties. It is a matter of course that they protected their valuables with various devices and ninjas had to obtain their properties by means of overcoming such obstructions. Ninjas had a variety of tools for that purpose. This does not mean that ninjas never used such tools as weapons as it depended upon the situation the ninja was in. Excellent Ninjas were able to adopt tools as weapons in a heartbeat when situations changed. For instance, in an emergency, ninjas could substitute a saw for a sword when they were raided by enemies. The key thing to remember is that any kind of daily appliance was able to be used as arms, even common tools such as kitchen knives or chopping boards. Well, " Shikoro(しころ) " was one of the key tools that ninja held onto . 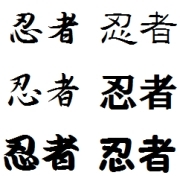 Shikoro was a kind of “kaiki tool (開器、or 壊器) ". In Japanese "開 (kai) " means " to open" . " 壊 (Kai) " signifies " to break" . In short, Kaiki was an implement for the closed doors or fences. Almost all kaikis were the same as carpenter's tools used when building a house in terms of shape and function. Kaiki’s were made portable and compact for the purpose of being highly concealable. 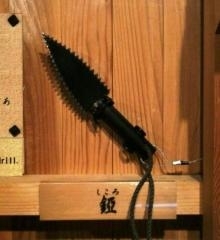 Quite simply, shikoro was a kind of a double‐edged saw. Shikoro were around 160-210 mm in length and a little more than 100g in weight. They were so small that ninjas could keep them on themselves. There were some shikoro that were even smaller than the sizes mentioned too. Using a shikoro demanded a strong use of force from a ninja. They varied in shape, one variety was orbicular, others were similar to Kunai (苦無). Ninjas used shikoro in order to make a hole on the face a wooden fence to see what was going on inside and to look for any invaders, the shape of the shikoro was perfect for cutting a hole through hard wood with the sharp edges. On other occasions, shikoro were used as rope cutters. It is said that ninjas usually brought at least three shikoros on their missions.